Ballets, opera, classic films—Arizona’s immaculate historic theaters have seen it all. Utilized for a variety of live performances and film showings, the historic theaters of Arizona have a past to uncover. Whether it’s a charming theater on Route 66 or sprawling spaces in city centers, here are the 10 best historic theaters in the state. You can take a trip to the roaring twenties at the Orpheum Theatre. This central Phoenix theater originally opened on Jan. 5, 1929. At the time, it held traveling vaudeville shows, an impressive 1,800 seats and even a primitive form of air conditioning. The Orpheum underwent an extensive restoration in the late 20th century and was reopened in 1997. Today, it’s a hot spot for must see shows from today’s top performers. There’s no denying the appeal of Fox Tucson Theatre. This legendary theatre first opened as a performance space in downtown Tucson in 1930. It’s been dubbed the “Crown Jewel” of Downtown Tucson and has a special connection with the local culture and arts scene. Fox Theatre served as Tucson’s movie headquarters in the mid 20th century until closing in 1974. The Fox Theatre Foundation purchased the building in 1999 and pumped in millions of dollars into an extensive restoration project. Fox Theatre reopened on New Year’s Eve 2006 and has been a go-to spot for live music, musicals, and films ever since. Willcox may be a small city, but it has no shortage of history. This southeastern Arizona city was once bustling thanks to its railroad and cattle production. Today, only a few thousand people remain. You can still see remnants of Willcox’s storied past at the Willcox Historic Theater. This independently operated theater has been continuously running since 1937. You can catch live on-stage performances, newly released films, and festivals at this throwback theater. Tucson’s Congress Street is no stranger to historic buildings. It’s home to the iconic Hotel Congress, which was once the site of famous criminal John Dillinger’s capture. It’s also home to the Rialto Theatre, a famous theatre originally opened in 1920. At the time, Rialto played silent films accompanied by a revolutionary Kilgen pipe organ. The theatre underwent new ownership and renovations in 2002. Today, it’s home to a new kind of entertainment. Rialto Theatre is a top venue for concerts and live music for performers from all around the world. You might not expect an Arizona theater to be destroyed by snowfall. That’s exactly what happened to the Majestic Opera House in 1915. This Flagstaff theater suffered a full collapse after heavy snowfall destroyed its roof and walls. Thankfully, the theater was rebuilt as the Orpheum Theater two short years later. Though it closed in 2002, the theater underwent renovations and reopened in 2005. Now it’s home to a variety of films, concerts, and community events. If you're in flagstaff still: Come to the Orpheum tomorrow at 10! You won't regret it! The Elks Theatre has had quite a few changes since its inception. Originally dubbed Elks Opera House, this historic theatre opened in 1904. It played everything from silent pictures to “talkies” to modern films until the 1980s. The City of Prescott purchased the theatre in 2001 in an effort to restore it to its early 20th century glory. It now hosts a number of live performances in the 500-person theatre. It doesn’t get much more historic than Route 66. You can take a tour of this legendary highway in the small Navajo city of Holbrook, Arizona. Why not catch a flick along the way? Roxy Theater, located in Holbrook, originally opened in 1954. Though it closed in 1994, it reopened in 2003 after an extensive renovation. The old-style theater seats 327 people and plays newly released movies. You can take a trip through time at the Valley Art Theater. This was one of the first business ventures for Red Harkins, founder of the local chain Harkins Theatres. Valley Art Theater opened in 1940 and still maintains its classic movie theater vibe. You’ll find a free-standing ticket booth, classic movie posters, and a single screen at this old-school spot. This vintage theater is also centrally located amid Tempe’s popular Mill Avenue. Taking a trip to Yuma? You won’t want to miss the Historic Yuma Theatre. This impressive building first opened in 1912. Previously known as the Zeller Theater, it held over 900 people and had an old mission-style design. Unfortunately, the theatre burned down in 1913. It reopened in 1927 and continued to play vaudeville and movies. It’s now part of the Yuma Art Center and is home to a number of live performances. Looking for some Arizona history? Make a trip to the “Town too Tough to Die.” Tombstone was home to some of Arizona’s most memorable moments in the Wild West era. 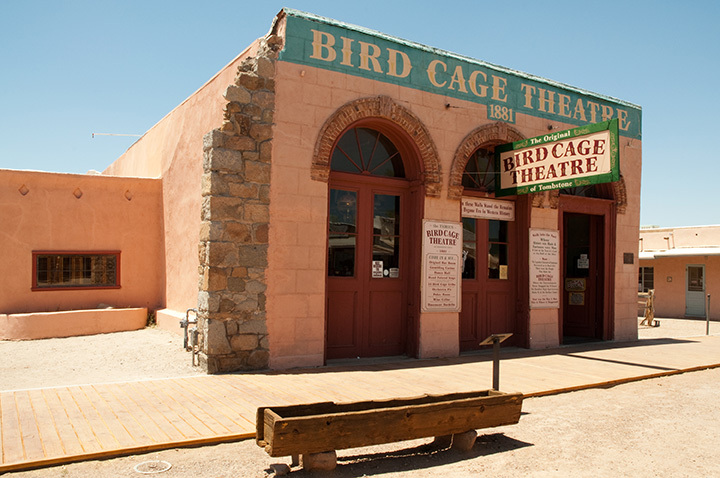 You can visit the historic Bird Cage Theatre on a trip to this western themed town. The theatre opened on Christmas Eve 1881 and remained one of the town’s focal points for many years to come. Today, you can take a self guided tour or a ghost tour of this historic theatre.